Because of NewNowNext's dedication to celebrating the anniversary of the movie Troop Beverly Hills every year, I recently discovered that Tobie had never seen it for one reason or another. As this movie has long-played an unusually memorable part of my growing up, I had to make sure that he'd get a chance to watch it as well. This movie is an unusual artifact from the late 80's that totally reflected a lot of the eccentricities of 80's culture, Los Angeles life and a lot of Shelley Long. I can't quite explain how these different elements came together as a movie about girl scouts, but it did and it all oddly worked out. Now don't get me wrong, this is hardly the best movie of its time nor is it something that everyone liked when it came out. But it's just one of those quirky experiences that have managed to garner a rather niche cult following over the years. It's not an easy movie to recommend, but it has its appeal for those of a similar mind. Synopsis: Troop Beverly Hills is a 1989 comedy movie directed by Jeff Kanew. The screenplay was written by Pamela Norris and Margaret Grieco Oberman. Phyllis Nefler (Shelley Long) is a Beverly Hills socialite going througha separation with her husband. 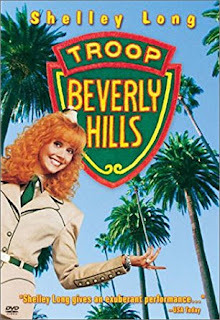 In order to show she's not the shallow, self-centered person that her husband says she is, she decides to volunteer to become the new den mother for her daughter Hannah's (Jenny Lewis) Wilderness Troop, this being Troop Beverly Hills. And thus well-meaning Phyllis does her best to take on the challenge of leading these similarly wealthy young girls in a girl scouting experience. But of course she's not at all prepared to deal with the great outdoors and she begins to add a distinct Beverly Hills twist to her adventures with the girls. And this doesn't sit well with a fellow scout leader, Velda (Betty Thomas) and she makes it her misssion to ensure that Troop Beverly Hills is brought down and pretty much broken up. What I Liked: The movie is campy on a whole number of levels, especially with the advantage of hindisight. It's an odd creation of its time and one that includes all the trappings of the 80's including thick shoulder pads, vibrantly bright outfits and now obscure celebrities like Robin Leach of Lifestyles of the Rich and Famous. It's just one of those movies with now strange references that include the likes of the Marcoses as dictators. More people also remember this movie for its limited music whether it's the classic "Kumbaya" or the major earworm that was "Cookie Time". Yes, a popup concert-style performance was naturally the best way for Beverly Hills kids to sell loads and loads of Wilderness Girl cookies. It was just that sort of a time I guess? Or that sort of a hyper-caricature view of how they thought rich people lived? Whatever the reasons, it all just worked so well. What Could Have Been Better: Having re-watched the movie after so many years, I have to admit that the movie has more than its share of issues. Pacing is terrible inconsistent and there are so many sub-plots that they juggling including Phyllis' relationship with her husband, some of the stories of the girls themselves, Velda's insecurities and what have you. There is a LOT going on and not everything gets attention nor should it. And the editorial decisions in terms of what should or shouldn't get feature time were all over the place. Obviously the movie doesn't age well, nor does it have to even attempt it. But the movie has a lot of narrative dead ends that I wonder why we had to go in that direction. Some of the back and forth over the divorce was just a waste of time and some of the side aventures with the Wilderness Girls troop were just odd. But hey, a lot of comedies from that time period were like that in terms of structure, if you can even call it that. TL;DR: Troop Beverly Hills still has a lot of funny moments, especially when you get the references the movie makes all throughout. It has an odd sort of charm and it's frozen in time almost but it's still a fun experience. Thus the movie gets 3.5 new badges that Phyllis creates for Troop Beverly Hills out of a possible 5.